I joined ClassPass in late August as well, in hopes of finding acceptable cardio alternatives, semi-regularly attending yoga to really stretch out my tight legs, and trying new-to-me stuff like barre and SurfSet. Needless to say, my return to the gym and the 3 or 4 days a week running schedule was not a smooth one. 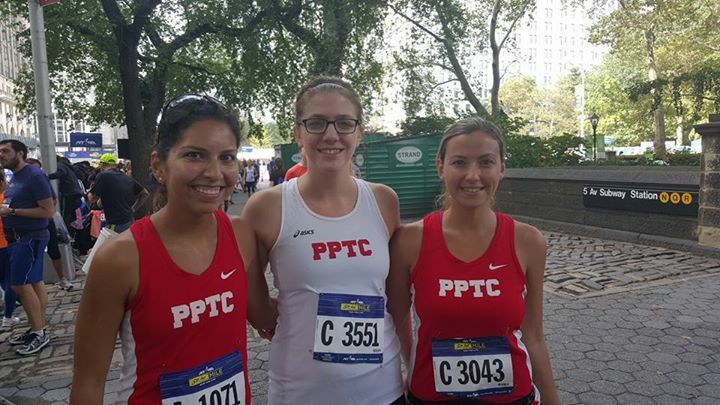 The weekend before the 9/13 5th avenue Mile race, I had to adjust my goals a bit. My A-goal was still sub-7 minutes but this seemed highly unlikely. I negligently was in the Hamptons during Labor Day weekend, when I had otherwise planned on a track time trial, so I chose to push it on a treadmill instead on the Tuesday before. I huffed and puffed my way through a half mile at 8 MPH (7:30 minute mile), slowed down for a half mile, then squeezed in another half mile at 8.1 MPH (wow, really upping the ante) during the Serena vs. Venus Williams U.S. Open game. This let me know that I could at least go under 8, where an 8:10 was my fastest 5K split this year so far. I really wanted to hit under 7:19 because this is the best mile time of mine that I can remember from High School. I was a sprinter and hurdler from 8th grade – 11th grade, so the mile always seemed and felt like an impossibly long distance to me. The longest I ever ran at a meet was 800m, so it’s good to know I’ve had the same mental pacing issues for the last 1.5 decades. Would it feel really cool to beat 16-year-old me? Yes. I am the same height but have an extra 30 pounds on my frame. I rolled up to the Met Steps (so Gossip Girl!) at 8:20am or so Sunday morning, collected my # and T-Shirt (I’m not normally a fan of non-tech shirts but oooh this one is soft) and dropped off my bag after packing some Honey Stinger chews into my zipper pocket for the extra miles after the race. I wanted to cheer on the 15-29 Women (Group A) but was still in the bathroom line when they began. Good thing I’m new to Group C. I grabbed a few water cups after and sipped them slowly and slipped into the middle of my corral after the 15-29 Men started. I saw some much faster teammates of mine squeezing along the left side to get near the front, where they belonged. I happily stayed in the middle-back of the corral. At 5’9, I felt like one of the taller ladies, but I’m sure some of that was just the uneven ground. And we were off! I hadn’t reset my Garmin Forerunner 220 to beep every .25 miles because I planned to run the first half sub-8 then see how I felt. Of course, how does one feel after a quick but not sprinting half mile? Like they can pick up the pace. I went out a little fast (whoops, 6:50, didn’t mean to see you there! ), slowed for the uphill, then figured that since my heavy breathing wasn’t super audible, I could really speed up in the last 200m. I chose one other tall lady to catch up to and picked her off in the final 50. I couldn’t choose between quicker turnover and longer strides, so briefly resembled a fawn learning how to run. A friend tried to get a picture but I was just too fast for an iPhone on the final 100m. My watch said I’d cracked 7:24, which is exactly what NYRR agreed on. My stated B-Goal was sub-7:30, so that felt pretty good. Do I think I have a sub-7 in me? Yes, sure. Could I inch it down to 6:45? No, probably not at my current fitness and injury level. But those are goals for next year, when I hope to join my teammates at some local track meets after winter speed training classes. I’m coming for you, track mile. It’s been over a decade, but I’m coming for you. MarathonFoto got some terrible pictures of me during the race and a few after both solo and with teammates. The solo shots have me convinced that I need to learn some poses other than “sorority arm”, “peace sign” and “congratulatory arms up”. Will double-thumbs-up make a comeback? Stay tuned.